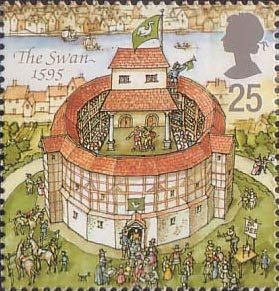 It is the only contemporary drawing of a theatre from the time that Elizabeth was queen of England (1553-1603): the illustration of Swan Theatre. And it is to be found in a manuscript by Arnoldus Buchelius from Utrecht. How did this unique drawing became part of this manuscript? And does it tell us something about Shakespeare’s plays performed in this period? The drawing of Swan Theatre can be found on one of the leaves of Buchelius’ Adversaria. Aernout van Buchell (1565-1641) was a well-to-do Utrecht amateur historian. Many of his manuscripts have survived, for instance his Diarium about his travels in France, Germany and Italy. In his Adversaria (‘Notes’) he wrote about various matters, and he also included a piece which he called Londinensia in the table of contents, to be found on fol. 131v up to fol. 132v. There are four amphitheatres in London of notable beauty, which from their diverse signs bear diverse names. In each of them a different play is daily exhibited to the populace. The two more magnificent of these are situated to the southward beyond the Thames, and from the signs suspended before them are called the Rose and the Swan. The two others are outside the city towards the north on the highway which issues through the Episcopal Gate, called in the vernacular Bishopgate. There is also a fifth voted to the baiting of beasts, where are maintained in separate cages and enclosures many bears and dogs of stupendous size, which are kept for fighting, furnishing thereby a most delightful spectacle to men. Of all the theatres, however, the largest and the most magnificent is that one of which the sign is a swan, called in the vernacular the SwanTheatre; for it accommodates in its seats three thousand persons, and it is built of a mass of flint stones (of which there is a prodigious supply in Britain), and supported by wooden columns painted in such excellent imitation of marble that it is able to deceive even the most cunning. Since its form resembles that of a Roman work, I have made a sketch of it above. (Adams 1920, 167). Next to De Witt’s words Buchelius also draws the theatre on one of the leaves, undoubtedly after the original by Johannes de Witt. The drawing represents Swan Theatre (fol. 132r), in Southwark at the south side where now Blackfriars Bridge is located, on the corner of Upper Ground and the A201. In 1589 Francis Langley bought this parcel and built a theatre there which was completed in 1595. A source from 1632 describes the deterioration of the theatre and nowadays it no longer exists. With the exception of the drawing in Buchelius’ manuscript there are no other illustrations of the interior, or of any other English theatre from that period. That makes the drawing unique in its kind. In his article ‘The Swan theatre drawing – a review’ Johan Gerritsen addresses the problem of the picture’s reliability. Based on other manuscripts there is a suspicion that Buchelius not only copied de Witt’s drawing, but also enlarged it, and that he was not very adept in drawing perspective. In addition, according to Gerritsen, Buchelius seems to suggest that he added the Latin captions in the illustration himself, to wit porticus, saedilia, orchestra, ingressus, mimorum aedes, procaenium en planities sive arena. Gerritsen bases his suggestion on the Latin Cuius quidem forma quod Romani operis umbram videatur supra adpinxi (‘Since its form resembles that of a Roman work, I have made a sketch of it above’). However, if this information was in a letter to Buchelius, it may explain why this sentence is included, since de Witt knew of course that his friend was interested in Roman buildings. Or it may reflect that Buchelius himself found it necessary to reproduce the drawing in his Adversaria. De Witt could have added the terms for Buchelius’ instruction, or Buchelius himself after his own research. This matter calls for further research. Does de Witt or Buchelius add information to his drawings more often? Is a term such as mimorum aedes for the actors’ house common in the Roman sources which Buchelius would have consulted then? May we expect Buchelius to have had any knowledge of theatres and acting at all? All these questions are important because Gerritsen wonders if Buchelius, besides the terms, could have added more, such as the scene played out on the stage. In the drawing we see a woman on a bench and a man who approaches from the right. There is also a standing figure behind the bench. Scholars interpret the depicted scene in various ways, for example, they are two women near the bench (queen and a lady-in-waiting) and a courier speeding towards them. This does not necessarily have to originate from one of Shakespeare’s plays. Or could it be a scene from the prologue of Shakespeare’s Henry V? It has also been suggested that it could be a scene from Twelfth Night (What you will). A more recent view tells us that it is a scene from Hamlet in which Hamlet meets the spirit of his father (cf. Freriks 1995). An edition of the play is known which also has a woman on a bench in that particular scene. Some even go so far as to say that de Witt visited a performance of the play in which Shakespeare himself played the role of the spirit. Also this question is important, because there are directors of Shakespeare’s plays who want the stage to be as sober as possible, for the simple reason that the drawing of the Swan Theatre suggests that the stage from the Shakespearean era looked like that. On fol. 2r en 2v Buchelius wrote a table of contents of the manuscript. He cites from the Annals of Egmond , includes several poems and letters, and an epitaph of Evert Vorstius. Well-known names that appear in the manuscript are Justus Lipsius, Dirk Canter and Petrus Scriverius. A detailed overview of the contents can be found in the description of the manuscript in the catalogue of Utrecht University Library. In this table of contents we also find traces of Cornelis Booth. The numbers of the folios halfway through to fol. 2r were corrected by his hand. This shows that in addition to the first folio also folios 102 up to 110 are missing. These are kept in the Utrecht Archives. This is also mentioned on fol. 101r in a 19th-century hand. According to the table of contents these are: ‘Diplomata vici veteris’ and ‘Carmina Johanni Aurati’, charters and poems by Johannes Auratus (Jean Dorat, 1508-1588). Adams, Joseph Quincy, Shakespearean playhouses. A history of English theatres form the beginnings to the Restoration (London 1920). Freriks, K., ‘Trompetten voor Hamlet: nieuwe interpretatie van een tekening uit 1596’, in: NRC - Handelsblad, Cultureel Supplement, 3-11-1995. Gerritsen, Johan, ‘The Swan theatre drawing. A review’, in: Folio. Tijdschrift van het Shakespeare-Genootschap van Nederland en Vlaanderen 2 (1995), p. 34-38. Horst, K. van der, et al. (ed. ), Handschriften en oude drukken van de Utrechtse Universiteitsbibliotheek. Catalogus bij de tentoonstelling in het Centraal Museum te Utrecht ter gelegenheid van het 400-jarig bestaan van de bibliotheek der Rijksuniversiteit, 1584-1984 (Utrecht 1984), p. 276-278 nr. 132; drawing on p. 277. Hulshof, A. & Breuning, P.S., ‘Brieven van Johannes de Wit aan Arend van Buchel en anderen’, in: Bijdragen en mededeelingen van het Historisch Genootschap (gevestigd te Utrecht) 60 (1939), p. 87-208; 61 (1940), p. 60-99. Ichikawa, M., The Shakespearean stage space (Cambridge 2013). Pollmann, J., Een andere weg naar God. De reformatie van Arnoldus Buchelius (1565-1641), Amsterdam 2000 (also published as a PhD thesis at the University of Amsterdam: Another road to God, [s.n.] 1998; also published as: Religious choice in the Dutch Republic. The reformation of Arnoldus Buchelius (1565-1641), Manchester 1999). Wilson, Jean, The archaeology of Shakespeare. The material legacy of Shakespeare’s theatre (Stroud 1995). Aernout van Buchell, Adversaria, Utrecht, University Library, Ms. 842 (7 E 3).